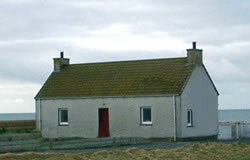 A simple 19th century croft house, Croft Garden Cottage is now a delightful coastal retreat just for two. The cottage sits at the heart of a traditional South Uist croft, amidst coastal meadows fringed by rocky outcrops and ribbons of silver sand. Lean on the garden wall and your gaze will be drawn to the Monach Isles and beyond to St. Kilda, then to Mingulay and Barra in the south. Whether you wish to discover the island’s wonderful wildlife or archaeology, immerse yourself in the Hebridean culture and landscape, walk, cycle, play golf, or fish, Croft Garden Cottage is the perfect environment for relaxing in comfort and style. Situated on the north west tip of South Uist it is well situated for travelling to the other islands and enjoying the variety of landscapes and activities that the islands have to offer. Sympathetically refurbished, the old croft house combines contemporary luxury with traditional simplicity. Croft Garden Cottage has been carefully designed to allow you to enjoy the freedom and privacy of self-catering without sacrificing the traditional comforts of a fine country hotel. The special finishing touches, from oriental rugs and Harris tweed throws to fine linen sheets and duvets filled with pure silk, and a welcoming tea tray and a bunch of fresh herbs will help to make your holiday a very special experience. Whether you wish to curl up with a good book, listen to music or just sit and watch the sea you will find the open-plan living area comfortable and tranquil. A wood burning stove will keep you warm in the cooler evenings and the cottage is kept cosy throughout the year by a central heating system. The modern kitchen is fully equipped with all the essentials for either convenience or gastronomy. The bathroom has a contemporary minimalist style with a walk-in-shower, with soft towels, luxurious bathrobes and aromatic Scottish toiletries. Croft Garden Cottage part of a working croft and is in an environmentally sensitive area. We regret we are unable to accommodate children or pets. Smoking is not allowed in the cottage. Visit our website [listed above]for further details and availability and booking information.